(CNN) -- Media rights group Reporters Without Borders is urging nations to not recognize the results of Iran's presidential election, citing censorship and a crackdown on journalists. 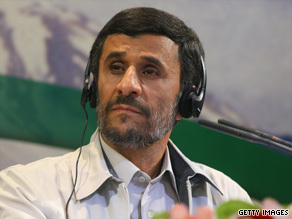 President Mahmoud Ahmadinejad holds a news conference on June 14 in Tehran, Iran. The nongovernmental group, which advocates freedom of the press, said it has confirmed the arrest of four reporters by Iranian authorities, including one who won the organization's press freedom prize in 2001. In addition, the France-based group said, it has no information on 10 other reporters who have either gone into hiding or have been arrested. "A democratic election is one in which the media are free to monitor the electoral process and investigate fraud allegations, but neither of these two conditions has been met for Mahmoud Ahmadinejad's supposed re-election," the group said Sunday in a statement. Independent observers were not allowed to observe the voting on Friday, and foreign reporters have been blocked from covering the ensuing demonstrations by supporters of Ahmadinejad's rival Mir Hossein Moussavi, who are claiming ballot fraud. Foreign news Web sites, such as that of the BBC, have been blocked, and the satellite broadcast of the Voice of America partly jammed, the group said. Reporters for an Italian station, RAI, and for Reuters were beaten by police in the capital, Tehran. A CNN producer was also hit with a police baton. Iranian authorities closed Al-Arabiya's Tehran bureau for a week without explanation, the Arabic network said Sunday. Two reporters were attacked outside Moussavi's headquarters on Friday, according to Reporters Without Borders. The Web sites of pro-opposition supporters are inaccessible, and the government also has periodically shut down access to social networking sites, making it difficult for information to reach the outside world. "An election won by means of censorship and arrests of journalists is not democratic," the group said.